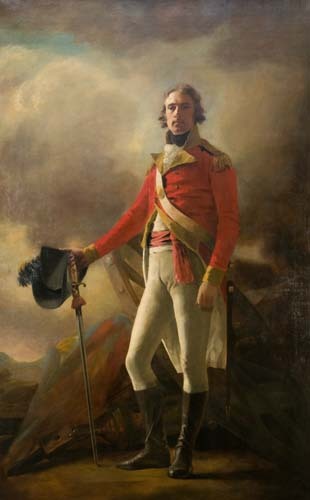 Raeburn may have made this painting to commemorate General Hay MacDowell's 1795 departure from the 57th Regiment of Foot, with which he had served for five years. He would go on to be named commander of the British forces in Madras, India. The low perspective of the life-sized canvas elevates MacDowell to the status of a hero, while the vivid colors provide animation to an otherwise-static pose. The use of these simple devices to create a monumental effect helps to explain why Raeburn, who had no formal training as an artist, was the preeminent portraitist in Scotland in the late 1700s and early 1800s.